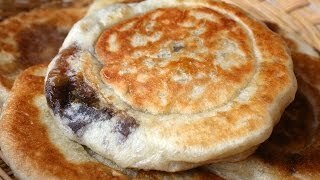 Hotteok is a flour dough pancake filled with sugar syrup inside. It’s one of the most popular street snacks in Korea. Ok, now it’s time for me to release my hotteok recipe! I used to make hotteok for my children. How often? So many times! When they came home from school, I would surprise them with my hotteok. I never made it before they came. I prepared some well-fermented dough and the brown sugar mixture. That’s all! Once they entered the home, I said, “Wash your hands and come back to the kitchen! Hotteok will be ready~” with big smile. My children were so happy and excited! 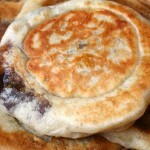 A glass of milk and hot hot hotteok with sizzling golden syrup! Wouldn’t you like it? Yes, children love it! If you want to entertain your children, wait for them with the preparation just as I did. I make hotteok for myself and my friends these days. Where are my little children!! I sometimes miss the old times. They are already grownups and live far away from me. Flour, water, dry yeast, salt, vegetable oil, sugar, brown sugar, walnuts, and cinnamon powder. Place 1 cup of lukewarm water into a mixing bowl. Add 2 tbs white sugar, 2 ts yeast, ½ ts salt, 1 tbs vegetable oil, and stir it well. Add 2 cups of all purpose flour and mix it with a rice scoop, or by hand. Let the dough rise. It should sit with the lid closed at room temperature for 1 hour. After an hour the dough will rise to double its size. Knead it to remove the gas bubbles in the dough. Let it rise for another 10-20 minutes. Knead the dough again to remove the gas bubbles. Place and spread about ½ cup flour on your cutting board. Put the dough on your cutting board and knead it. Make it into a lump, and cut it into 8 equal-sized balls. Take 1 dough ball, flatten it, put some filling in the center of the dough, and then seal it to make a ball. Heat up your non-stick pan over medium heat and add some vegetable oil. Place 1 ball on the pan and let it cook for 30 seconds. When the bottom of the dough ball is light golden brown, turn it over and press the dough with a spatula to make a thin and wide circle (about the size of a CD). Let it cook about 1 minute until the bottom is golden brown. Turn it over again and turn down the heat very low. Place the lid on the pan and cook 1 more minute. The brown sugar filling mixture will be melted to syrup! Posted on Thursday, March 18th, 2010 at 12:07 pm. Last updated on August 7, 2017. Posted January 10th, 2019 at 8:02 pm | Log in to reply. Posted January 2nd, 2019 at 8:02 pm | Log in to reply. I want to made that sweet pancakes but im afraid because im still allergic in yeast wat shold be the subtitute or can i just not add that?? Posted March 1st, 2018 at 9:22 pm | Log in to reply. Maangchi~ I always love your recipes and I’m very shocked that my parents appreciate all the Korean foods I cook! Sometimes they aren’t expressing it but their faces says it all. They love it!! I am currently interested about 찹쌀 꿀호떡 chapssal ggeul hotteok it looks really good but I have not learn it yet. Posted January 26th, 2018 at 11:55 am | Log in to reply. I made your Hotteok tonight and they turned out perfect! Excited to make them for a group of people I’m having over tomorrow night for some Korean food. This recipe was originally posted on March 18, 2010 at 12:07 pm by Maangchi. It was last updated on August 7, 2017. The video was watched 1,598,986 times on YouTube & has 16,505 likes!